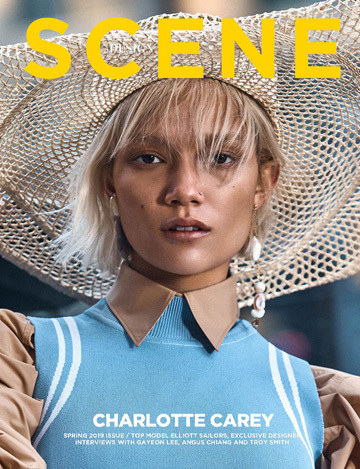 DESIGN SCENE Issue 030 is out on Wednesday, and before the release discover our print cover starring the top model CHARLOTTE CAREY photographed in New York by Fashion Photographer Yossi Michaeli at Wilhelmina Artists. In charge of styling was Bárbara Vélez, with beauty from Hair Stylist Linda Shalabi at See Management, Makeup Artist Ann Benjamas at Wilhelmina Artists and Nail Artist Jini Lim at See Management. Production by Sheri Chiu. Charlotte who is represented by Muse Model Management wears for the cover shirt Salvatore Ferragamo, dress PH5, hat Sensi Studio and earrings SVNR. DESIGN SCENE 030 is out on Wednesday.